We’d love your help. 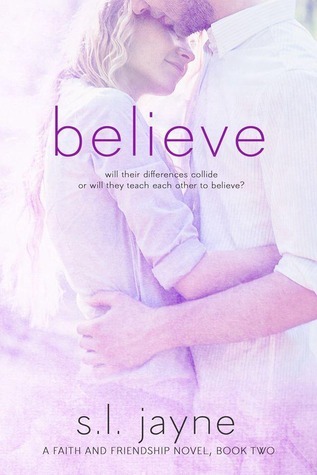 Let us know what’s wrong with this preview of Believe by S.L. Jayne. Rylee Blake is broken. She has little faith, no trust in people and doesn't believe in herself. Having grown up in a home with a verbally abusive stepfather and a mother suffering from depression, an 8 year old Rylee has her heart shattered completely, hearing the words that no child should ever hear, Rylee first met Matt in The Promise, for them it was just the beginning. To ask other readers questions about Believe, please sign up. This book should be read after reading "The Promise". You are pulled back into Ava and Rylee's lives. Rylee is friends with Matt but she knows he wants more. Some of the things he says to Rylee she feels that he wants to own her. Rylee and Matt finally come together. They are past the friends and moving on to a relationship. Will his possessive ways push Rylee away? Or will she love that he wants her so much? Will a small kink in the relationship wipe everything away or make them stronger? You also get to hear more of Ava and Ryan's story in this book which I love!! Simply amazing again. I loved Ava & Ryan's story but freaking loved Rylee & Matt's story. I loved Matt from the beginning. It was so amazing to see Rylee come out if get shell and believe that she is loved and cherished not only by her family and Ava but by Matt. After letting him in to her heart their relationship grows and becomes epic. Well done my Angel, amazing job again. What a beautiful book! I loved the promise and feel just as strongly about this one. I was given this book to read in turn for an honest review!!! Rylee was finally away from Boston where she had grown up away from the Stepfather she had grown up to hate. Her and Ava made a pinky promise at age 8 to move away from their hometown and as far away as possible from her stepfather. The two best friends move to California, it’s exactly the fresh start that Rylee needs. Rylee is finding her freedom and independence and finding her true self again. Ava always told Rylee to have faith, fun I was given this book to read in turn for an honest review!!! The two best friends move to California, it’s exactly the fresh start that Rylee needs. Rylee is finding her freedom and independence and finding her true self again. Ava always told Rylee to have faith, fun and believe in Love, but Rylee doesn’t believe in true love or that she is even worthy of being loved. I love reading, I have way too many book boyfriends and I love to chat! I have a daughter who I love more than the stars. She is my whole life. My family have and always will be my rocks, they have stood by me through everything. I sometimes talk too much, I have huge blonde moments, big freak outs and hyper moments, which lead to me being reminded to breathe! After starting to read again more regu I love reading, I have way too many book boyfriends and I love to chat! I have a daughter who I love more than the stars. She is my whole life. My family have and always will be my rocks, they have stood by me through everything. After starting to read again more regularly I met some great girls online through our love of books, and they have become some of my closest friends, it's really true that somebody doesn't have to be right next to you to make you feel great. Since being an admin on a Facebook book page I have gotten to know some amazing authors and a few of those I now consider great friends.